Early to mid-June is the greenest and lushest time in our experimental and ever-changing Green Roof Garden, one of the few rooftop landscapes in the area that invites the public in for a visit. 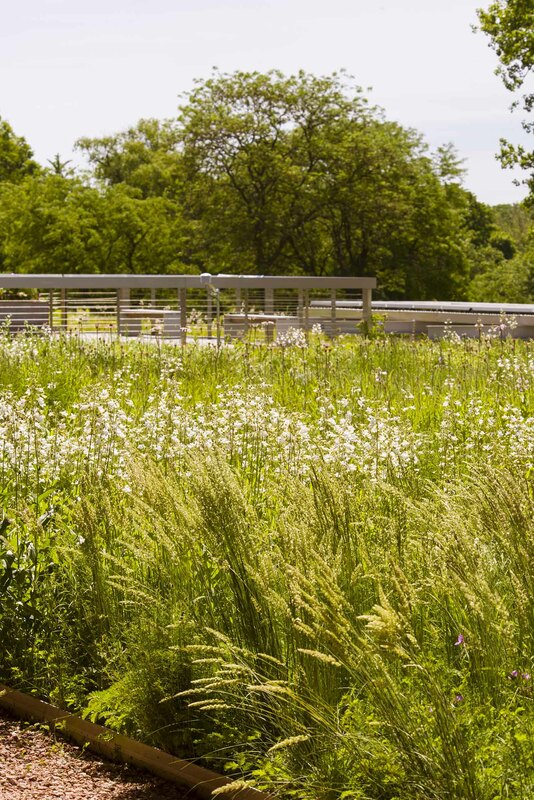 Native plants create a prairie-like effect atop the Plant Science Center. Now in its fourth growing season, the 16,000-square-foot garden creates an oasis atop the Daniel F. and Ada L. Rice Plant Conservation Science Center. The green expanse helps reduce rainwater runoff and insulate the building from heat and cold. The garden also serves as living laboratory under the stewardship of Richard Hawke, plant evaluation manager. The skyblue aster (Symphyotrichum oolentangiense) is “finally established and starting to do its own thing,” he said, and flowering for the first time are the dwarf false indigo (Amorpha nana) and largeleaf wild indigo (Baptisia alba var. alba). The latter takes its time in a landscape, first putting down a taproot—hard to do in eight inches of growing medium! 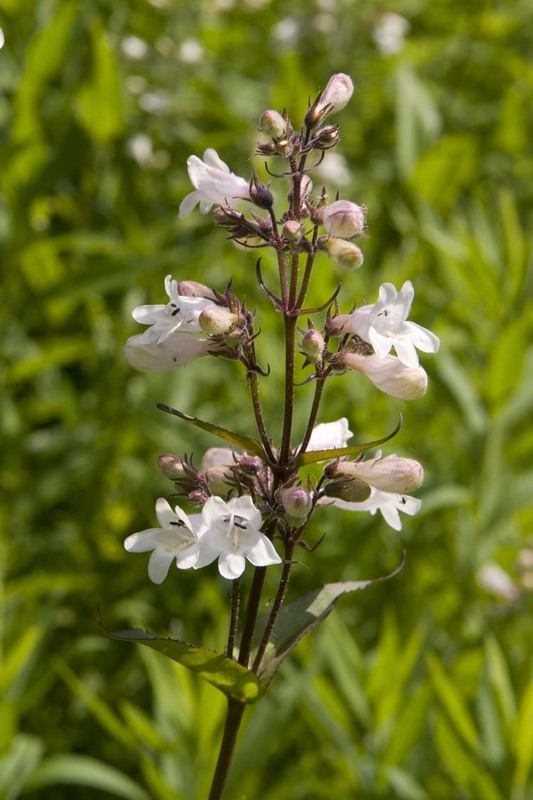 Once established, it sends up a tall spike of showy, white flowers that bloom for several weeks. Like other members of the bean or legume family, wild indigo improves the soil by increasing its nitrogen levels. The deep coral native columbine (Aquilegia canadensis) is beginning to spread, blending into the lavender and white blooms of the hairy beardtongue (Penstemon hirsutus) and foxglove beardtongue (Penstemon digitalis) growing nearby. Bright yellow lanceleaf coreopsis (Coreopsis lanceolata) and the silvery, feathery foliage of field sagewort (Artemisia campestris ssp. Caudate) add to the prairie aesthetic with their layered colors and textures. The more formally planted Josephine P. & John J. Louis Foundation Green Roof Garden North features wavy patches of sedums, a popular rooftop variety, alternating with familiar cultivars of plants. Flowering bulbs bring the garden into color in early spring. Mourning doves, robins, swallows, mallards, Baltimore orioles, and purple finches count among its bird visitors. What a beautiful description of the Green Roof Garden. It makes one greatly appreciate the efforts of Richard Hawke for his stewardship, the Botanical Garden for its sponsorship and the writer for creating such a vivid image of this experimental wonder. We wish we could be among its visitors, along with the orioles and finches.